Smith’s Variety sold 17,000 solar eclipse glasses. Journal photo by Jordan Wald. 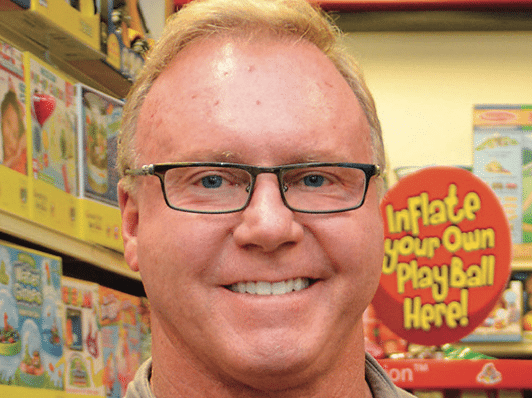 It took a once-in-a-generation event to convince him, but Smith’s Variety owner Jim Glazner has decided against selling the iconic Mountain Brook toy store. Aug. 21’s solar eclipse was the deciding factor for Glazner, who had been planning to sell the store after his mother, Mary Anne, passed away in April. Mary Anne had run the store since the death of her husband, Lit, in 2003. Together, they had owned the store since 1976. Glazner had planned to sell the store because it had become too difficult to balance with his full-time career in cosmetic medicine. He’s the owner of the Vestavia Hills-based Prescription Aesthetic and Wellness Spa. Maintaining the store’s dedication to customer service was a priority for Glazner while looking for a buyer; continuing the tradition of the store and its place in the community was not negotiable, he said. There were several potential buyers, including longtime employees Steve and Katherine Sudduth. But after Smith’s Variety sold 17,000 solar eclipse glasses, paper eyewear that enabled people to look at the eclipse without damaging their eyesight, Glazner reconsidered. Jim Glazner. Journal file photo. The lead-up to the event was filled with frantic efforts to buy more glasses to meet the growing demand. The glasses were selling out as quickly as Smith’s could get them in stock, Glazner said. Lines to purchase the glasses stretched out the door and down the block. Glazner said he was reminded of the Beanie Babies craze, which also drew massive crowds of people to the store. But more than just selling glasses, the weekend reminded Glazner of everything he valued about the store – the generations of customers who visited his store, the support and professionalism of the store’s staff, Smith’s place as a community landmark. “I had forgotten, quite frankly, how much I loved it,” he said. When the eclipse finally happened, people were still showing up at Smith’s to buy glasses. They were out of stock, so Glazner and the rest of the staff went out to the parking lot to share their eclipse glasses with those who were too late to buy their own. As the crowd in the store’s parking lot turned their eyes toward the sun, Glazner said he experienced a moment of profound peace. Glazner was moved by the scene of people gathering outside Smith’s to share that rare moment. But it wasn’t until that evening, speaking with his wife, Tammie, that he came to a realization about the future of the store. Tammie Glazner had looked at their clinic’s schedule and realized it could be rearranged so that they could spend more time at Smith’s than they had thought possible. Jim Glazner would be able to work at the store on Wednesdays and weekends, with Tammie Glazner working there on Tuesdays and weekends. Now, Smith’s is looking forward, working to restock its inventory (the eclipse crowd bought more than just glasses), and preparing for the Christmas rush, which already is starting. The decision is helping Glazner to move forward, too.